Welcome to February's installment of the regular, bite-size, data-focused updates I am sharing with Meta! You can check out previous posts if you like. We just wrapped up the fielding period for the 2019 Developer Survey, so for this month, I want to share one more analysis from 2018's data, before I buckle down with my teammates to the task of the new batch of survey responses. How would you describe the Stack Overflow community, as a whole? You can see the most common words that respondents used to answer this question in the main analysis/report. Respondents said that the Stack Overflow community is helpful, good/great/the best, focused on questions and answers, and so on. We have more information about the survey respondents who gave us these answers, though, so we can dig deeper into these kinds of opinions about the Stack Overflow community. For example, how do the words people use to describe Stack Overflow change with years of coding experience? These words are the ones that change the most with years of experience. They are not the most common for each level of experience (those are mostly the same as the most common overall) but instead are the ones that demonstrate a change in how they are used by less and more experienced developers. 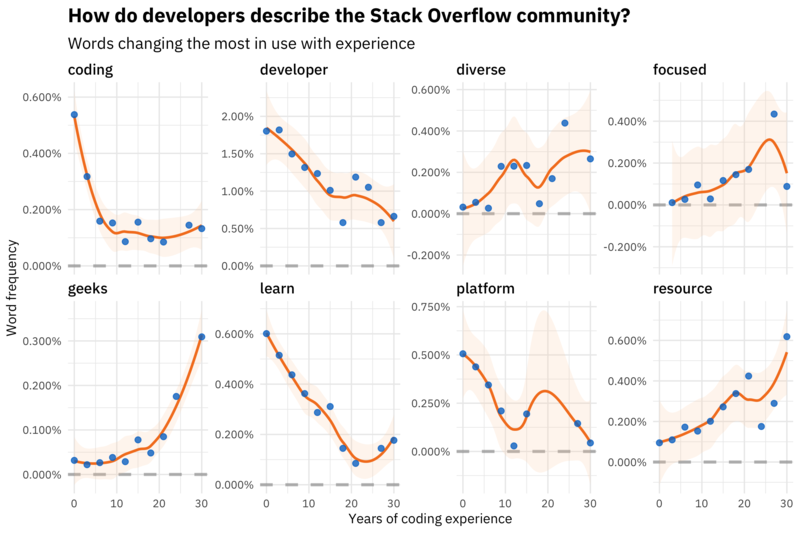 The most experienced developers are more likely to see the Stack Overflow community as a group of focused geeks, and are more likely to use the word "diverse" to describe the community. I was curious what these users meant by that, so I looked at these responses in their entirety. It turns out these responses are addressing diversity of technical background, interest, and nationality. Less experienced developers are more likely to talk about Stack Overflow as a community for learning. "source to learn and share knowledge"
More experienced developers, by contrast, are more likely to frame their understanding of the Stack Overflow community in terms of a resource. "very effective and valuable resource"
"an invaluable resource for any programmer"
Sometimes we as a community experience these understandings of site identity in tension, and we can see these differences in the very words our respondents use to describe who we are as a community. It's unlikely we'll resolve these deep tensions in this single post, but what are your thoughts or reflections? Do you have topic ideas for future data science explorations? I wonder if the differences of the age factor are due to the amount of experience we have or due to how we learned to program computers in the first place? For example, I have > 25 years experience, and I learned through books. By the time I was writing code that delt with the internet, I already had 5 years of professional experience, had graduated from college, and was already using O'Reilly's "... in a nutshell" books for reasources, and was the sole developer at the company so I had to learn debugging and such stuff by myself. Thus, I have no idea how to respond to beginner questions that really need debugging help or basic concepts because I never got to ask them myself, and I know I'm no good with them, so I don't try. I wonder if the lack of patience with beginners is really a matter of years of experience, or if it is because "we all learned the hard way, so you should too"? Maybe there is a way to look for that in the data? I personally don't see a conflict between the identities of learning and as a resource. The problem shouldn't have to be a problem when the mindset of a lot of people are willing to change from the stark attitudes they have. When I look at the new questions posted when the schools have started again and people are learning new concepts and the homework questions come, the usual response is a barrage of close and downvotes. A couple of comments when the person is lucky where to look for more information. I personally feel like there is little reflection on the intent of the poster. Some questions just scream: I don't have the slightest of clues on how to get started please help me. I personally try to help those people either via comments where they can look for answers or deepening their understanding. When I feel that an answer might help others with a similar struggle and I find the risk of close votes minimal, I might invest in an answer to educate the question poster and possible others who might stumble upon it. That doesn't mean we should give free roaming access for help vampires with gimme the codez questions. But I feel like a little time should be invested in trying to discern the intent of OP. Does OP want us to do homework for him or does OP actually wish to learn? The biggest difficulty in learning is knowing what to look for, how to apply different concepts into one solution, and we should keep the quality of Stack Overflow high. What I propose is that when a question is closed as too broad, typing error or whatever close reason was picked, and people who have sufficient rep and get satisfaction from helping people and not per se for the points can open a chat room with the user, sort of "mentor chat" where things can be clarified, spoken out and solved within chat, away from the main site. Others could join the chat to either help or watch when not enough reputation. When the issue is resolved or OP has learned enough to make it on her/himself the OP could mark it as resolved and the mentor(s) could get 5 points for the work they invested. I would say for mentor chat privileges one should have sufficient rep and familiarity with the site, something like 500 points and more than one year membership. These are just my musings on how to keep Stack Overflow a high quality resource for looking up things, whilst also enabling the offering of help to newbies by those so inclined. It is great Stack Exchange has a Data Science team, I am sure you are doing awesome things behind the scenes. However, I miss posts showing results/patterns you have discovered through data which lead to improvements on how the site works. In other words, I miss more applied analysis. Do you have topic ideas for future data science explorations? I'd like to see real data as an answer to my question in Close a question when it gets 3 (or 4) leading 'Close' votes?. I went the most far I could using data from SEDE. If my queries are correct, I have an hypothesis that when a question receives 3 or 4 close votes without them being intervened by an edit or 'Leave Open' vote, it gets closed anyway (I believe real data would make this even more evident; it is explained why in that post). This means we are wasting 1 or 2 close votes that could be cast to decrease the Close Vote review queue backlog. By making such adjustment to the source code, we could decrease the number of review votes that age away without changing the pattern on how closing works, i.e., without being less or more rigorous than what we already are. While other proposals about closing are analysed (for example, being more rigorous by reducing the total close vote count threshold no matter what; or giving high-rep users extra weight on close votes) this could be a change with immediate impact with no cost (except the one adjusting the code). It would be great if the Data Science team could take a look on this. Again, if the queries are correct, it is like at least 50% of the job is already done. I probably use this website in the way very similar to how inexperienced folks do: when I bump into a coding problem in the topic where I have little experience or no experience at all, I search the web for solution and often find an answer at Stack Overflow. You see - despite having quite a bit of programming experience in general, when it comes to using SO I am usually just as inexperienced in the topic of interest as your next student doing their homework. Okay, I will drill deeper in the way how I use the site and try to guess what could be different between me and them. One thing that springs to mind is what happens when answerers explain how they arrived at the solution. To me this part is rarely interesting because I am well aware of typical ways to solve coding problems; if I wouldn't find the answer I would probably solve it myself using the same approach. For less experienced developers things could easily differ here. "Oh so this kind of problems can be solved by studying specification! (...by applying bit mask, using profiler, etc etc)". I think that besides providing concrete solution to particular problem SO answers can often teach newbies various ways of doing things - that's where they learn while I am not. You can probably try to check if there is such a difference by asking respondents questions like, how much they learned about approaches to solving programming problems from answers at Stack Overflow. If this part of my analysis is sensible then responses from experienced programmers will tend to be mostly like "not much" while inexperienced ones will be likely tell that they learned a lot. Another thing we may differ about is expectations of what happens after we discovered needed solution. I learned from experience that this doesn't help me memorize it. There are few things that I remember having repeated but very infrequent need and every time I need these things I have to repeat search for solution again, I can't really learn these things without sufficient practice. Inexperienced developers who haven't broken their noses like that may fall into believing that once they found solution at SO they have learned it forever without any additional practice. They may perceive this as learning things (while my experience suggests that it really isn't). Speaking of survey, it seems hard to properly spell a question that would explore if there is such a difference indeed. Maybe there should be something like asking respondents how likely it is that some time later (if they don't practice in the topic) they will be able to repeat solution discovered at SO without searching for it again, something like that. If my analysis holds, such a question will probably get more optimistic (and less realistic) answers from inexperienced developers. Maybe it's time to consider a new site: Stackoverflow for begginer? We have a rift between 2 groups in here and it's not going to change. We have 2 communities in the same site that want 2 different things.